He moves with the grace and elegance of a hero. His face betrays no expression while in his mind race a thousand thoughts. The sleek touches of the ball and nimble movements of the feet revived a whole nation’s image like anything. A Human could never be capable of this,they said, and I agreed. This is no Human, this is Zinedine Zidane. man at the center of the honours and success has been Zinedine Zidane. French Football had died after Michel Platini won them the European Championship in 1984. Platini retired in 1987 and so did French Football. Zidane made an entry to the side only in 1994. The 7 years in between were a nightmare for French Football. France failed to qualify for the 1988 European Championships and the 1990 and 1994 World Cups. The managed to make their way into the 1992 European Championship but were ousted in the First Round itself. And then came Zidane. He made his mark immediately, scoring 2 goals against the Czech Republic to draw the match at 2-2, after playing just the last 27 minutes of the match as a substitute. France qualified for the Euro 1996 held in England and lost out to the Czechs on penalties in the semi-finals. But the Big Year was 1998. Zidane was the backbone, if not more, of the French squad that demolished Brazil 3-0 in the Final at Paris in the World Cup Final to win their first World Cup. Zidane was named the FIFA Player of the Year. The Year 2000 saw France become European Champions, with Zidane once again in the center of it all. Zidane guided France through the 2002 World Cup Qualifiers and saw France cement its place there but could not play due to injury. He just featured in the last Group Stage match, unfit. Without Zidane, France looked so off-colour that they did not manage to score a single goal. Ousted in the First Round, France left Korea-Japan shamefacedly. Once again came the Euro, this time in Portugal 2004. 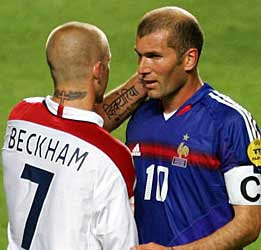 Zidane opened France’s Title defense with two goals against David Beckham’s England in stoppage time. One, a magnificent free-kick while the other, a rock solid penalty kick. France stumbled out of the Euro in the quarter-finals against the eventual winners Greece. Zidane announced his retirement, and France found themselves groping in the dark, unable to get desired results in the 2006 World Cup Qualifiers. Zidane came back from retirement and took France to the Final of the World Cup. where they lost agonizingly in the penalties, after Zidane had head-butted Materazzi to get himself a red-card in extra-time. Zizou left football after that World Cup. Now, as the Euro 2008 has begun, France take to the field in a major Tournament Without the services of Zinedine Zidane in the team for the first time in 12 years. And just like what happened to France during those shirt terms without Zizou earlier, their opener against Romania was disappointing to say the least. A dull stalemate saw zero team chemistry, almost no chances created and pathetic football. Will this be how France will perform without Zidane? Has France succumbed again till they find their new-hero? We will have to wait and see. I just hope that France do something in the tournament and avenge that painful loss in the World Cup Final. France have searched their depths in the search of a desperately needed saviour. The country has gone to such a big extent, that every second-talent in the nation has been termed the ‘Next Zidane’. From Ribery to Benzema, Nasri to Gomis and even Jeremy Toulalan have been compared to the Great! Was Zidane such a common phenomenon, that can occur every other year! World Football will not witness another Zidane for years. It is true that France without Zidane is almost nothing. Whenever Zidane has been off the field, their play has taken a change, for the worse. What France need at the moment is an inspirational captain in Viera and the experienced players in the World Cup and Euro winners Thuram, Henry, Makelele among others. I Just hope that France make this a year to remember and make it big at the Euro. The start to the campaign may have been disappointing, but so was the case in the World Cup 2006. But then again, that year there was Zizou….. So after a big wait of 4 years, the Euro is back! Something that always lives up to the hype it gets, it’s also one of the tournaments where amazing football is on display, probably because of the fact that one bad game could mean another 4 year wait! In summer 2004, Portugal caught the attention of the whole sporting world. The 16 teams battled it out for the one trophy, but it was the team no one had even thought of entering round 2, that ended up Champions! Yes, it was Greece! I remember properly, on June 12th was the opening encounter, Portugal vs Greece. Despite a Ronaldo header, Greece won the match 2-1. It didn’t move me much because I was more or less a neutral then. But it was the rematch of the two, the grand finale, where the Luis Figo lead side took once again on the Greeks! That match, I was heavily rooting for the hosts. They had played wonderful football to reach the Final, and i wanted the great Luis Figo to have a perfect sending-off from International Football, as he had earlier said that he would retire following the Euro 2004, a decision which he later took back to play in the World Cup in Germany. The 0-1 defeat was agonizing. Portugal had controlled the whole of the match. Deco, Ronaldo, Figo among others had done all that could be done. But as fate would have it, a header near the hour mark had sealed the Trophy in Greece’s name. Figo was ‘charged’ upon by a distressed Portugal and Barcelona fan invader, who ran towards him with the Barca flag, probably upset over his move to rivals Madrid. Figo didn’t move an inch, with an expressionless face and the fan threw the flag on his face before being tackled by the stewards. Figo later tore off the ribbon of the silver medal and threw the medal away. Yeah, but all that is history now. Now comes the Football Treat again. 16 Teams, 31 matches, 23 days! A perfect making for something really special. Here is a brief look-in into the various groups and teams. 1) Switzerland: The hosts have been one of the most improved teams in Europe of late. The proceeded from their group stage in the World Cup as leaders and made it till the quarter finals. A solid defence is their strength. Without any Big names, this squad could be the surprise package but I don’t expect to see them in the last stages. 2) Czech Republic: A wonderful football team. Coach Karel Bruckner will play with an experienced squad. From the towering Jan Koller up-front, to the stable Jankulovski in defence, this squad is almost perfect. A very good keeper in Petr Czech is also there to boost morales. Watch out for this team. Chances of winning the Trophy- 4/5. 3) Portugal: One of the teams that almost all soccer fans are looking forward to. Real title-favourites. They were voted by fans as the best football displaying team in the World Cup 2006. Ronaldo will have all eyes on him and deservedly so. This team can no more be referred to as dark-horses, and they may very well be out their to avenge last time’s pain. Chances of winning the Trophy- 5/5. 4) Turkey: Half of their country is in Asia, but don’t expect them to shy out of the Euro! Not a really favourite team, but they have surprised people in recent times. They did wonders in the World Cup 2002 by clinching 3rd place and did well in 2006 too. But I they have to do really well to proceed in this difficult group. Chances of winning the Trophy- 2/5. This group is one of the most balanced ones. From crowd support for Switzerland to heavy names in Czech Republic and Portugal, this group will witness interesting battles. But seeing Switzerland and Turkey proceed at the cost of Portugal and the Czechs is a bit unlikely, one might say!! 1) Austria: The co-hosts aren’t the best side in the world, but don’t even imagine that they’ll bow out without a fight. Yes, the odds are against them to proceed, but one never knows what all can happen with crowd support! 2) Croatia: The side that ousted England in the qualifiers, this side is one of the dark-horses. Striker Eduardo may be out with an ‘injury’, but Coach Slaven Bilic has many more trusted names at his disposal. Niko Kovac and Niko Kranjcar are the midfield-holders, who might just turn around the fortunes for this team. Never strike this team out, which is proven by their sudden upsurge in World Rankings. From FIFA Rank 125th in 1994 to Rank 3 in 1998, it has been a roller-coaster ride for them. Chances of winning the Trophy- 3/5. 3) Germany: Probably one of the best squads for this year’s Euro! This team played mesmerizing football under Klinnsman in the World Cup 2006 and has never looked back since. With big names in the form of Ballack, Klose, Schweinstiger etc, this team is a genuine favourite to win the title. With huge builds and towering heights, a physically dominant team too. 4) Poland: They have had a good run in major tournaments recently, qualifying for the last two World Cups and this Euro. They missed out on Euro 04, but now are the co-hosts of Euro 2012 with Ukraine. Expect a few moments of magic from them too. Chances of winning the Trophy- 1/5. This group is comparatively the easier group of Euro 08. Germany will play Poland as they did in the World Cup 06. That means Miroslav Klose and Lukas Podolski will once again play against their nation of birth! I expect to see Germany and Croatia proceed to Round 2. 1) Netherlands: A team that has expectations on its shoulders. Marco van Basten, who struck that amazing volley to win Euro 1988 for the Dutch, will be their coach this time round. A truly magnificent team, with Ruud van Nistelrooy, van der Sar, van Persie, Sneijder, Robben among other names, this team might just do it this time round. 2) Italy: The World Cup winners, Italy would try doing what France did, consecutive World Cup and Euro Titles. A defence-oriented team, it has stike force too in the names of Luca Toni and Cassano. Buffon provides safety between the sticks. Cannavaro’s injury and ouster from the Euro will definitely have an impact, though I imagine that they will cope with it. Chances of winning the Trpohy: 5/5. 3) Romania: They have been caught in the wrong group, one might say. But this team has the power to cause upsets and the other 3 teams would be vary of them. Hopes rest on Adrian Mutu and we all know he has what it takes to score and win a game. 4) France: The World Cup Runner-Ups, who lost cruelly in the penalties of the Final, will definitely try to reassert themselves as a great team by winning this Euro. Notable changes have occurred from the squad that took on Italy on July 9, 2006. No Zidane, Barthez, Thuram and even Trezeguet! But Trezeguet was dropped. This team too has all the makings of the Winners. This group needs no introduction. This is it! The Group of Death. No one can predict which teams will go through, but my guess would be France as the leaders and Italy or Holland on goal difference!! 1) Greece: The Title Defenders!! They have more or less the same squad as that of Euro 04. One can never say that the team won’t proceed after what we saw in 2004. But yes, it would be long shot to say that they will successfully defend their title. 2) Sweden: Another well balanced side that hasn’t tasted success in recent times. This team relies on pace. A great striker in Zlatan Ibrahimovic should treat fans to an amazing display of football. 3) Spain: One of the best teams that has won just 1 major Trophy, The Euro in 1964. Now, 44 years later, this team once again takes the field to prove that it is a force to reckon with at all stages. The surprise in the squad, though, is that Raul is missing. 4) Russia: Proceeded to the Euro at the expense of England. This team may not have what it takes to win, but certainly expect them to challenge the others in the group. This Group may not be referred to as the Group of Death, but in its own way, it is! You can’t pick two teams out of Spain, Sweden and Greece. But I expect Greece to stay behind this time round. With this now, I hope for a Wonderful Euro ahead of us. May the Best Team Win or probably May The Team You Support Win!! Enjoy this Football Fest, Friends. After, it comes once in 4 years!! !